23 Sandy will be closed for winter break through January 26, 2011. But, we are around (and working!) most of the month. If you need to pick up art or would like an appointment please contact Laura. We are very generous with appointments if there is something you need during the break. Also during January we will be heading to Los Angeles and San Diego to peddle artist books. Contact Laura if you’d like to arrange a visit. Our inventory of unique and limited edition artist books is always available for perusing on our online catalog here. We will be shipping web and phone orders during the break. Join us when we re-open on January 27 for and exciting new exhibition titled Photo Book Works. This international exhibition of artists’ books incorporating photography as a primary element debuted at Abecedarian Gallery in Denver in November and we are thrilled to have it travel here to 23 Sandy Gallery. Photo Book Works was juried by Mia Semingson, a photographer, book binder and educator in Boulder, Colorado. For this exhibition, Semingson selected the work of 31 artists from the United States, Great Britain, Switzerland and Australia. Online catalog coming soon. Check out our Artists in Inventory here. Hard to believe how time flies! But, really don’t I say that every month? 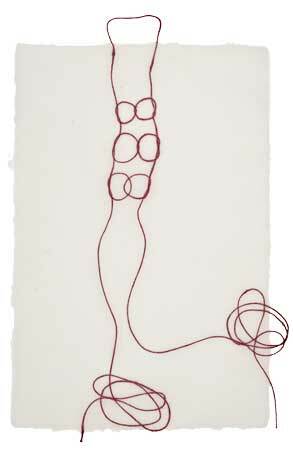 Join us for one last weekend with Helen Hiebert’s String Theory. A beautiful, elegant exhibition of string drawings embedded between lovely sheets of nearly transluent handmade paper. 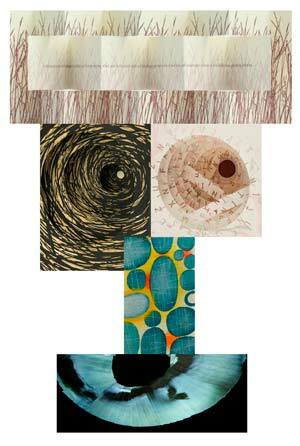 Also, showing for the last weekend artist books by Sue Huggins Leopard. Her book works inspired by the likes of Emily Dickinson, Marcel Proust and other literary idols are just gorgeous. 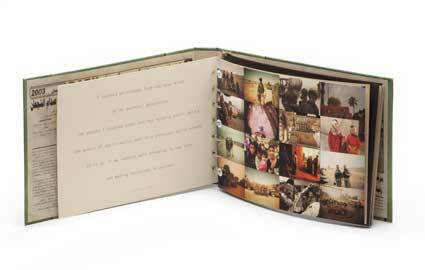 After Saturday the gallery will be closed until January 27th when we open with a show of photographic artist books. Jim has been featured in a few shows here at 23 Sandy—most recently our Book Power show back in June. Jim’s book, titled I Wouldn’t Wish War on My Worst Ememy is a powerful and haunting compilation of photographs and words from returning Iraq war vets. This book was acquired from this show by Reed College and is currently on display at the Museum of Contemporary Craft’s new show, Object Focus: The Book. Be sure to catch this amazing selection of artist books from the Reed College collection. It is an in-depth overview of the many different avenues of the book arts world, ranging from Fluxus to German conceptual artist books to modern experiments in the book form. Check out Jim’s book here. We still have this book for sale here in the gallery with all proceeds from the sale benefiting two non-profits that work with vets. Stop by the museum or the gallery to see this remarkable book sometime soon. You can learn more about the exhibition at the museum, which runs through February 26, 2011 by clicking here.